It’s a huge moment for African designers who have been breaking waves in the industry, as we’ve watched the world become infatuated with their designs. Not that we ever needed their approval but it's great to see our designs not only on our local stages and celebrities but for millions others to get to enjoy them too. We couldn’t be prouder of all our brilliant designers who are taking our style to the world. Get to know who they are a little better and what you could buy from them to spoil yourself this festive season. According to OkayAfrica, born to Senegalese parents; Sarah began her journey when she bought fabric from the market and had her friend's aunt make clothes for her. She then wore them to shows during Fashion Week in Paris where she received compliments from numerous people and realised there was a market for them. Sarah defines her style as carefree and we can definitely identify it in her designs. Here are some of our favourite items from Tongoro. Dyenaa’s brand, Peulh Vagobond was born after her divorce when she found herself a single mother. It was during that difficult period, that she developed a love for her sewing machine and developed a strong desire to bring her own creation to life. Turning lemons into lemonade, we admire women who turn their difficult circumstances into triumphs. Here are some of her items we wouldn't mind splurging on, get yours here. A Leaders in the Science of Fashion (LISOF) graduate, Rich Mnisi’s brand is exploding in pop culture. His recent collaboration with Coca Cola #CokeThreds to create a coca cola inspired fashion range, illustrates how he uses his designs to creatively tell stories. Not to mention the fact that Beyoncé wore his custom made rhundzu blouse we are all crazy about. Here are some of our favourite designs by him. Shop from here. Look: 12-13 Collection: NWA-MULAMULA: LOBOLA ‘19 Platform: @lagosfashionweekofficial Stylist: @petergeorgiades Men’s Shoes: @adidasza Inspiration: Continuing the centre of memory dedicated to my artistic muse and the place where I draw inspiration - Nwa-Mulamula. As the centre of my current inspiration, herstory is a universal story of keeping memory alive. She is a symbolic representation of African mothers in all their glory that has been lost in time, undocumented and buried in the depths of our hearts. In this collection I seek to imagine her into existence, through a day dream of her role as a matriarch set against the backdrop of a Lobola ceremony. Lobola is a ceremonial rite of passage in African culture that brings two families together through marriage. I draw from the visual elements and nostalgia of being a little boy running wild in the midst of a celebration. In this childlike dream, I am engulfed by Nwa-MulaMula’s stature and only awake to pieces of memorabilia. My pieces reflect highlights of colour, textures, gifts and prints that are reminiscent of this day dream. Symbolic of packaging that transports me back home. Look: 1-2 Collection: NWA-MULAMULA: LOBOLA ‘19 Platform: @lagosfashionweekofficial Stylist: @petergeorgiades Men’s Shoes: @adidasza Inspiration: Continuing the centre of memory dedicated to my artistic muse and the place where I draw inspiration - Nwa-Mulamula. As the centre of my current inspiration, herstory is a universal story of keeping memory alive. She is a symbolic representation of African mothers in all their glory that has been lost in time, undocumented and buried in the depths of our hearts. In this collection I seek to imagine her into existence, through a day dream of her role as a matriarch set against the backdrop of a Lobola ceremony. Lobola is a ceremonial rite of passage in African culture that brings two families together through marriage. I draw from the visual elements and nostalgia of being a little boy running wild in the midst of a celebration. In this childlike dream, I am engulfed by Nwa-MulaMula’s stature and only awake to pieces of memorabilia. My pieces reflect highlights of colour, textures, gifts and prints that are reminiscent of this day dream. Symbolic of packaging that transports me back home. A young man raised in a rural area with a dream of a career in fashion, Mmuso Maxwell was selected for Vogue Talents in 2017. The skillful designer studied fashion at the central University of Technology, where he obtained a diploma, and went a step further to study fashion design at Vaal University of Technology obtaining yet another diploma. When asked what inspires his designs, he said he draws inspiration from his Xhosa heritage and elderly women from villages. Here’s some of his work. Order yours here. Quiteria & George spoke about starting a fashion line together when they met in Mpumalanga Fashion Week, and the extraordinary duo couldn’t have made a better decision when they finally put action into words. 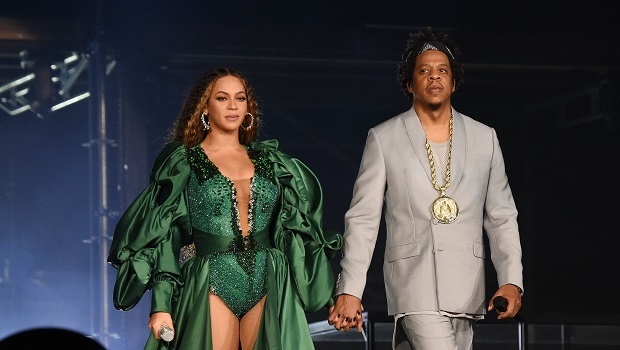 Their collaboration with the multi-talented businesswoman Enhle Mbali Maphumulo served us an iconic performance look by Beyoncé we will never forget. Get yourself one of their gorgeous dresses right here. @enhlembali_ looking absolutely gorgeous guys ???????? The beautiful Rebecca Zoro is the brain behind the affordable glamour brand Yhebe Design. The name behind the brand is of sentimental value to her because her paternal grandfather use to call her Yhebe. Rebecca decided to follow her long childhood dream in fashion when she took a training course in 2009. We loved the korika t-shirt Bey wore designed by Afrikanista. Here are some gorgeous designs by Yhebe Design, order here. Official visuals of AFRICA FASHION RECEPTION powered by @unesco. _______________________________________________________________ Styling @thisis_freddy / Shot by @viana_photography ! _______________________________________________________________ Thanks @annatourepr ! ?? Short blond hair is the absolute go to December hairstyle - or is it pink?